Discussion in 'SEN Enabler' started by Evilnat, Dec 2, 2018. Following the release of SEN Enabler v6.1.0 that gave support for 4.83 CFW CEX there was an issue with how the application was handling the Cobra Payload and while it would not interfere with the functionality of SEN Enabler and its feature it was having a side affect of things like PS2 ISO's not working, the developer has done alot of work the past month to resolve the issue with this new update of 6.2.0 that is now available for download (see links below). From here I (STLcardsWS) will allow for Evilnat to take over with all the details pertaining to this update that also include a number of other new additions and fixes. New version 6.2.0 released after one month of hard work and a lot of tests in all supported CFW, this time i tested it myself in CEX and DEX. Cobra hash fix option will install the appropriate stage2 to the current FW version, check Cobra data and fix all current hashes. Patch syscalls/IDs/XMB modes are now firmware independant, you can use it on newer CFW without waiting to new version with support, but CFW spoof and all related will be unavailable until i add support to avoid issues. Syscall and IDs patch modes have been removed, they are unnecessary. SEN Enabler plugin is now completely firmware independant, all options will work in any version. Syscall and IDs patch modes have been removed too, and replaced with Patch IDs on startup and Disable syscalls on startup, these options works with Patch files, it depends on the option chosen will search in USB or internal HDD, with HDD option will search in /dev_hdd0/game/NPEA90124/USRDIR for ConsoleID.txt, MAC.txt and PSID.txt, you can import these files with Import patch files option in SEN Enabler settings menu (Page 2). Flag files have been removed too, with the new two options are more than enough. zeromant, Zar, T.A.U and 6 others like this. do u have 4.83 keys for puad 1.5 by evilnat? T.A.U, bitsbubba and Louis Garry like this. Hi all! how can i flash the new ps2 emu files on my ps3 ? T.A.U and bitsbubba like this. 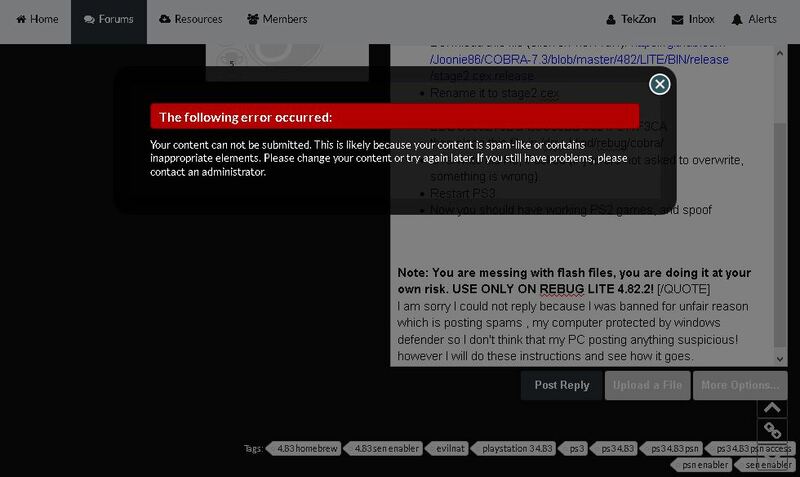 Cobra hash fix option causes webman to stop working. SiegHart93, bitsbubba and T.A.U like this. Dean is the only who can update multiMAN, it shows 4.75 because 4.83 and 4.75 (along with more versions) has the same data, that's why shows 4.75 but you are on 4.83 do not worry. T.A.U and SiegHart93 like this. oh ok dude ! sorry for ask so many times but i have this last problem and ur the only one who can help me bro ! my ps3 is a ntsc cechl01 and since i updated to cobra ferrox 4.83 my ps3 is having issues when playing games on sdtv ntsc for example. i have so many games region usa (blus) and when start the game on a old ntsc sdtv i get black and white screen like if the game is pal where is not ! to see whats going on i conected my ntsc hdtv 32 and i unchecked the options for 1080p,1080i,720p and i just leave the 480p option checked but when i start the game it switches from 480p 60hz to 576p 50hz idk why if my ps3 is ntsc and the games and the tv's are all ntsc , is there any way to fix that ? is this a retail game or a psn game? 'cause I believe you need to refresh the database by rebuilding it if it's a psn game. thank you @Evilnat for your hard work, I was involved updating Cobra but i couldn't be in touch because my psx-place account was blocked from making a comment , that was a welcome for my new registration, anyway i was hoping to help but not my bad. @Khabibov I think it's because you were posting links and you only had 2 other post. I'm pretty sure it is 10 post you need before you can to post links. That may be because the link you posted was to another post here and not to a different site so it wasn't flagged.